This tangy, sweet-and-smoky, soul-satisfying butternut braise is remarkably easy to make. Which, I’m sure you’ve gathered by now, is what Taco Tuesday is all about. As many great recipes do, this one starts with frying up some chopped bacon. Then, it’s on to the roasted tomatillo-garlic-chipotle sauce, which acts as a braise for the cubed butternut. Quick note: Generating fork-tender chunks of butternut in a short time isn’t really be possible without executing one of my favorite kitchen tricks, microwave steaming. Place the butternut in a bowl with a tablespoon or two of water, cover with plastic wrap, poke a couple of holes in the plastic and microwave for 3 or 4 minutes to steam them nearly tender before mixing with the sauce. Add some cheese (I like a soft goat cheese here), and a few herb leaves and it’s taco time. Scoop the butternut pieces into a microwave-safe bowl, cover with plastic wrap, poke a few holes in the top and microwave on high for 4 minutes. Meanwhile, in a large (10-inch) skillet set over medium, cook the bacon, stirring occasionally, until crispy, 5 to 7 minutes. Add the butternut and tomatillo sauce to the pan, raise the heat to medium-high and bring the sauce to a brisk simmer. Cook until the butternut is fork-tender and the sauce has reduced by about half its volume, about 15 minutes. Taste and season with salt (it will need only about ¼ teaspoon because of the bacon’s saltiness). 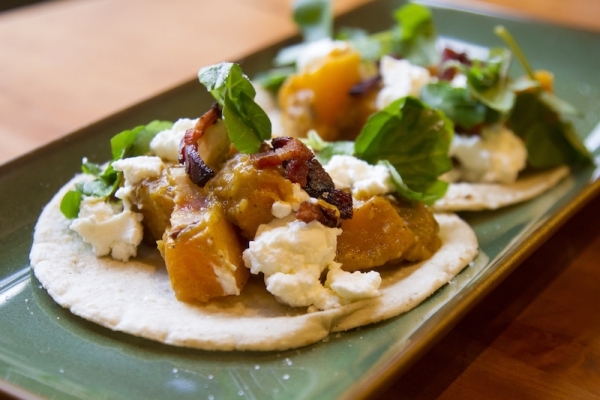 Scoop into warm tortillas and finish with a generous sprinkling of the goat cheese and watercress.